Despite the fact that so many market pundits were expecting a significant stock market decline over the summer it didn’t happen. Instead what we got was a relatively stable market that by the end of the quarter was almost unchanged. While volatility did increase significantly in September, the S&P 500 was up 1.1% for the third quarter as a whole. But the return in large cap U.S. equities masked weakness in other areas. For example small cap U.S. equities and international equities were both down close to -6%. The story was similar for bonds in the third quarter. While the BarCap Aggregate Bond Index was essentially flat there were weaknesses in other bond markets. Bank loan bonds, high yield, inflation bonds, and global bonds were down -0.7%, -2.0%, -2.2%, and -1.9%, respectively. Although I would have liked there to have been robust gains it can be healthy once in a while for the markets to take a breather in the midst of a bull market run. And make no mistake about it, we have been in a bull market run since the low in March of 2009 with the S&P 500 up over 200%. Weak Economy: It is true that the economic recovery coming out of the recession in 2007 & 2008 has been much weaker than most recoveries. But there has been slow and steady improvement and the unemployment rate continues to decline. More recently concerns have been cropping up that a slowdown in Europe and China will negatively affect our markets. Volatility has certainly increased due to these worries. While this is a real concern I believe world economic leaders will continue to pursue accommodative monetary policies and ultimately this will not throw us back into recession. Global Instability: There are always conflicts going on around the globe. The only question from an investor’s standpoint is how will those conflicts affect the economy? Let’s face it – whatever happens in the Ukraine won’t affect U.S. corporate profits. The same is true of the protests in Hong Kong. The situation in the Middle East is a bit different only because of the abundance of oil in that region. This is less of a problem now than it would have been at any time in the past 40 years as we are experiencing a North American energy boom that has reduced our dependence on foreign sources. The wildcard in these conflicts is the chance that they could escalate and become all out war. I doubt it but it is certainly worth keeping our eye on. Fear for Rising Interest Rates: This is the one that really confuses me. Not because rates are rising or falling on any particular day but because people as so afraid of the prospect of rising rates. Believe it or not you should want higher rates. Not super high, but certainly higher than now. Why? Because higher rates would mean that the economy is growing. It would mean that we have some inflation (a little of which is good). And it would mean that the reverse (weak economy and deflation) won’t happen. Let’s put higher interest rates in perspective. Here is a chart of 10 year Treasury bond yields over the past 143 years (1871 to 2014). The first thing you realize is that the 10 year treasury yield was rarely under 2.5%. In fact over the 143 year period it was only under 2.5% 10% of the time. And the vast majority of that came between 1938 and 1954. Are there any similarities between the 1938-1954 period and today? In 1938 we were coming out of the Great Depression and two bear markets (1929-1932 and 1937). In 2008 we had experienced two painful bear markets (2000 to 2002 and 2007 to 2008) including the Great Recession. From 1954 to 1972 (19 years) the yield (i.e. interest rates) on the 10 year treasury bond went from a low of 2.29% in April of 1954 to a high of 7.91% in May of 1970. What happened to the stock market over that time? The S&P 500 rose over 800%. Obviously there are many differences between now and 1954. As the saying goes, history doesn’t repeat itself but it does rhyme. 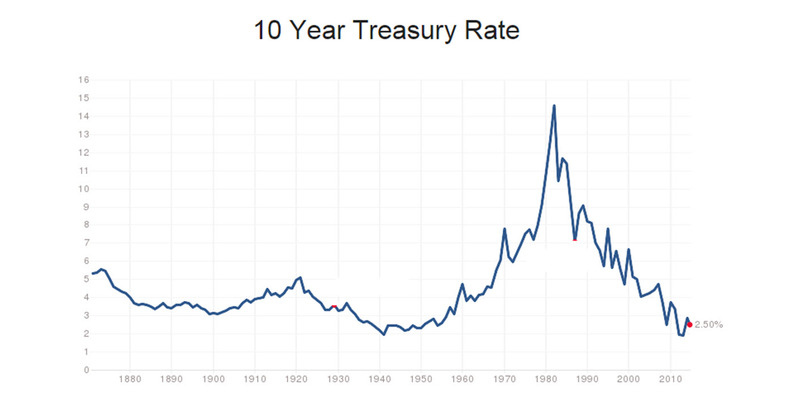 While I do think interest rates will rise I do not think higher rates will affect the stock market for a long time. Usually there is some deviation in the returns of Tempo’s three investment programs. Due to a similar outcome for stocks and bonds returns were all close. As you know by now all of our strategies are diversified. This means that our exposure to the few areas in the stock and bond market that didn’t lose money (see above) was limited. And while we did hold up much better than the worst performing asset classes we were not able to generate positive returns. -0.6%. Despite this I was very happy with our portfolio. We had exposure to two of the few areas of the stock market to make money (large cap value and healthcare) and our other positions (real estate, utilities, bank loan, and high yield bonds), although down, were down modestly as compared to the poorer performing areas of the market. The Tempo Dynamic Income Program lost -1.2% for the quarter. As our most conservative strategy I am always disappointed when we lose money. But when the best performing bond category is flat and the rest are down it can’t be all that surprising that our return was somewhere between the best and worst. Interestingly most Tempo Lifestyle Program accounts had returns that were between the two Dynamic Programs (-0.6% to -1.2%). The more aggressive clients were at the lower end of the scale due to the fact that the worst stocks did worse than the worst bonds. We have some notable successes and failures in Lifestyle portfolios at the moment. On the plus side we have insulated many of our positions from exposure to a strong dollar. As we expected much of the negative results in foreign securities was due to the strength in the dollar. The returns for our dollar hedged positions during the third quarter in international equities, Japan equities, and global bonds were +0.5, +5.3%, and +2.5%, respectively. Had we not hedged these positions our returns would have been -6%, -2%, and -2%. On the negative side we continue to hold an inverse bond position. This fund will make money if interest rates rise and so far that has not happened. As you know from previous issues of the Vantage I do expect that rates will rise. I may be a bit early on this trade but I do expect it will eventually pay off. Keep in mind as you read this that despite the fact that all three programs were down in the third quarter they are all still up year to date.